Larry’s Lessons is a fictional autobiography which tells the story of Larry Tonks, a precocious mathematician, who loses his virginity at the age of 50, and earns a fortune by ghost writing for the celebs. Larry’s great passion is topology, an abstract region of mathematics, but his scholarly career is ended prematurely when his subject is abolished from the educational agenda. Can there be an alternative to the contemplation of pleasant shapes? Larry searches in vain, facing constant rejection and a hostile world. And after twenty years of searching, he discovers the reason for his social exclusion: he’s too ugly! Help is just around the corner, however, thanks to a government scheme to assist the radically non-glamorous. And in a secluded mansion, somewhere in Wales, Larry is fired with a new passion. Plus a large appetite. His new passion is storytelling, and the feast is a residential course on the subject. His tutors are captivating, and the menu voluptuous. For starters: table talk garnished with foreplay. The main dish: provocative presentations, personal tuition, and a rich, spicy sauce of sexual capers. And the dessert: food for thought, a love affair or two, and the start of a new career. 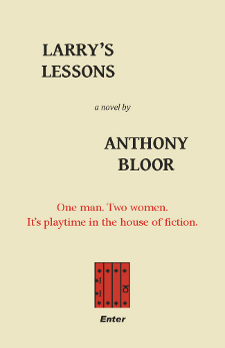 An exploration of the art of storytelling, and a satirical take on the misery memoir, Larry’s Lessons is a romantic comedy with a difference. Or two.